Despite only starring in four episodes of popular Netflix series Stranger Things, Nancy’s best friend -AKA Barb Holland- has become a cult favourite. With her bright red hair, high-waisted mum jeans, and ‘I don’t care what anyone thinks’ attitude, her unexpected demise at the hands of the Demogorgon struck a chord with fans, who have since demanded retribution for her death. She has been raised on a pedestal from a minor character into one of cult status, and when the new series was announced, all anyone could talk about was the possibility of a storyline seeking justice for Barb. With the new series not due for release until the end of 2017, Stranger Things fans will have to wait a little longer to find out what the future holds in store for the character of Barb. But in the meantime, they can peruse an unofficial guide that has been released in commemoration of their favourite ‘no-nonsense’ girl. 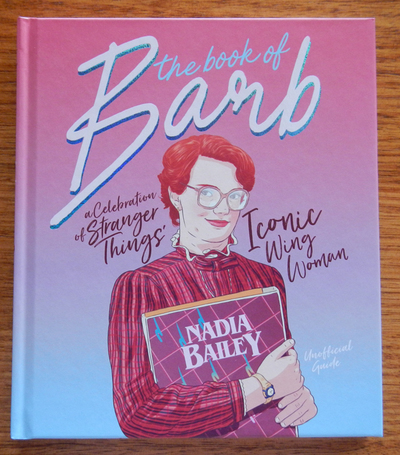 The Book Of Barb- created by show fan Nadia Bailey- is ‘a celebration of Stranger Things’ Iconic Wing Woman’. Split into three sections, the book features well-drawn illustrations of scenes between Nancy and Barb, quizzes, advice (including social, study and styling), and ‘Ask Barbara’ letters. While we don’t really learn anything new about her that we wouldn’t have already learnt from the show, this book still takes a focused look at her character, and tracks her existence as Nancy’s loyal best friend up to her heartbreaking pool scene and the subsequent ‘missing persons’ investigation that resulted. This is a detailed romp into the relatively short life of Barb, and anybody who is a fan of the character is sure to enjoy reading through this unendorsed guide to her life.